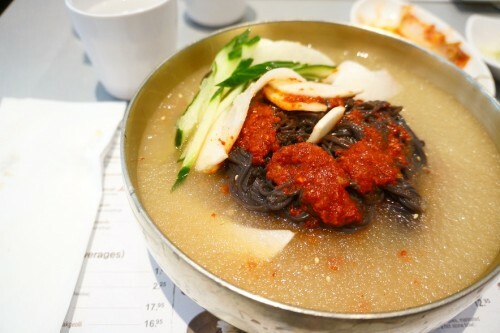 I think I’ve just discovered the perfect dish for summer: Naengmyun aka Korean cold noodles. Specializing in these noodles is Cho Sun Ok, a popular Korean restaurant located on the southeast corner of Yonge and Clark. Parking in the plaza is a challenge here. The restaurant is often slammed, so I recommend having one person jump out of the car to grab a number while the other person waits for a parking spot to free up. We came for a late lunch just after 1:00 on a Saturday and ended up waiting 40+ minutes. Once you enter the restaurant, head straight to the back where the cash register is located to grab a number from the server. The restaurant is quite large and looks like it was recently renovated. According to their website, they first opened in 2005 as a 24-seat restaurant. Since then, they’ve expanded twice and now have a capacity of 80 to keep up with their popularity. I’m sure it won’t be long before their restaurant occupies the entire plaza. 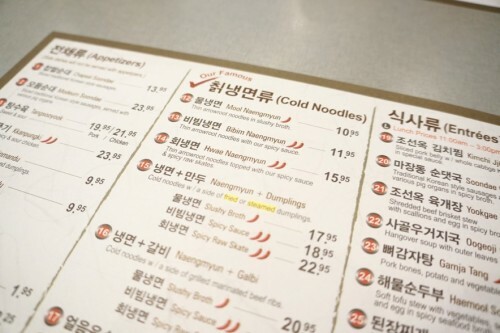 The cold noodles are a must order! While Cho Sun Ok is known for their cold noodle dishes, they also offer dishes you’d typically find at Korean restaurants like pork bone soup, bibimbap and bulgogi. 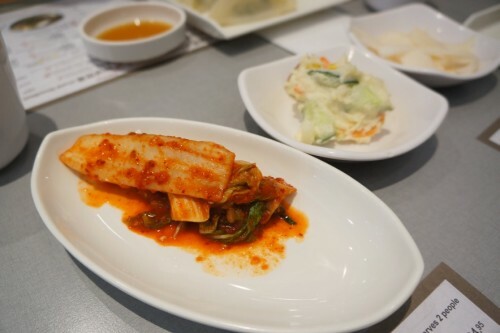 After ordering, we were served some Banchan which included kimchi, potato salad and pickled daikon. Not that I’m a kimchi expert or anything but I really enjoyed the kimchi here. It packed quite a punch! I decided to go with the Mool Naengmyun – thin, chewy arrowroot noodles in a slushy broth ($10.95) and made it a combo with a side of dumplings ($17.95). I really enjoyed the chew of the thin noodles but felt like I needed a pair of scissors at the table to cut them down a bit. They were extremely long which made them a little difficult to eat. The noodles were topped with a spicy red pepper sauce, pickled daikon, sliced cucumber, a slice of Asian pear and a hardboiled egg. It was crazy hot outside so I knew I wanted my noodles with the slushy broth. This dish was a total home run. It was so refreshing and the cool broth helped mellow out the spiciness from the sauce. Highly recommended. 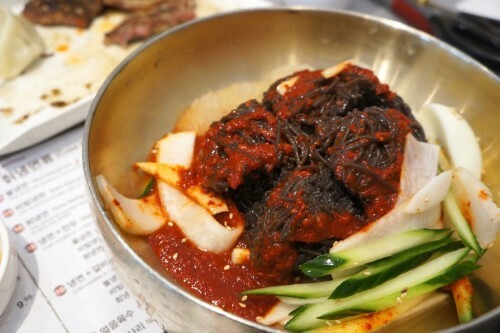 Mike went with the Bibim Naengmyun – thin, chewy arrowroot noodles smothered in a homemade spicy/sweet red pepper sauce ($11.95) and made it a galbi combo ($21.95). It was very similar to the dish I had ordered minus the broth. The pile of noodles came with a heaping serving of the spicy red pepper sauce. Since it didn’t contain the broth, the spice was much more concentrated. Despite having to take breaks since our mouths were on fire, it was still a really tasty dish. We both made our noodle dishes combos. 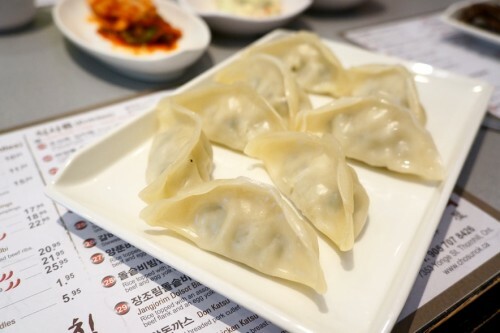 One came with an order of Mandoo – homemade pork dumplings with a homemade soy dipping sauce. You have the choice of getting them steamed or fried. We ordered the steamed version and I was very impressed with them. The pork filling was really delicious and I’d order this again in a heartbeat. 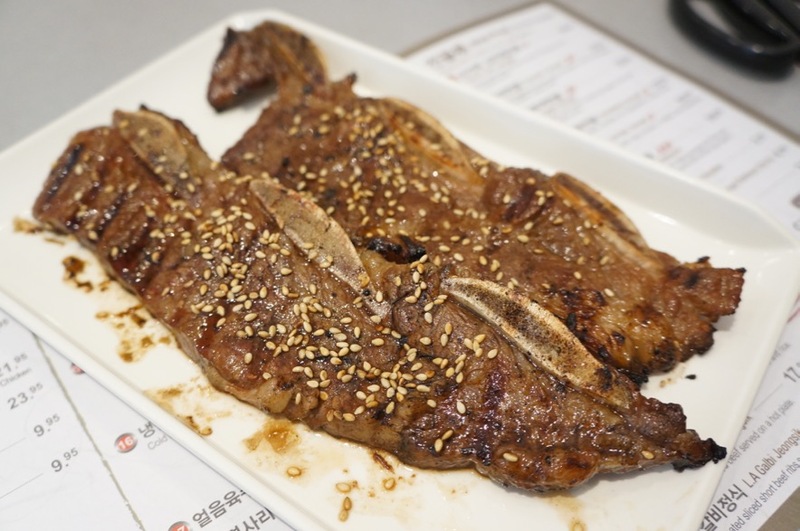 The other side dish we ordered was the Galbi which came with two slices of short ribs. They were incredibly tender and very much necessary since we didn’t have much protein in our meal otherwise. Overall, we had a great meal at Cho Sun Ok. There’s a reason why it’s always insanely busy here. You can bet that I’ll be here again this summer. The food looks and sounds delicious. I’m rarely in Thornhill, but it’s great to have a good meal option when I do pass through. I might even make the trip for that Galbi.